Colin Powell said, "A dream doesn't become reality through magic; it takes sweat, determination, and hard work." Tough but true. Dreams should be pursued to make it happen. But how? By coming up with a plan! On this fourth run, the focus is on all aspiring entrepreneurs who want to start their own business. Expect wonderful ideas, great "aha" moments, and practical answers to your questions as you participate in this inspiring and fun event! How do people ever crush their goals one after the other? What is the secret to achieving all that we aspire for? What sets apart successful people to the ones that are mediocre? These and many more are what we will answer in our interactive and sought-after goal setting workshop. We will talk about a very simple 3 step process that will help you get to your goals faster and more efficiently. 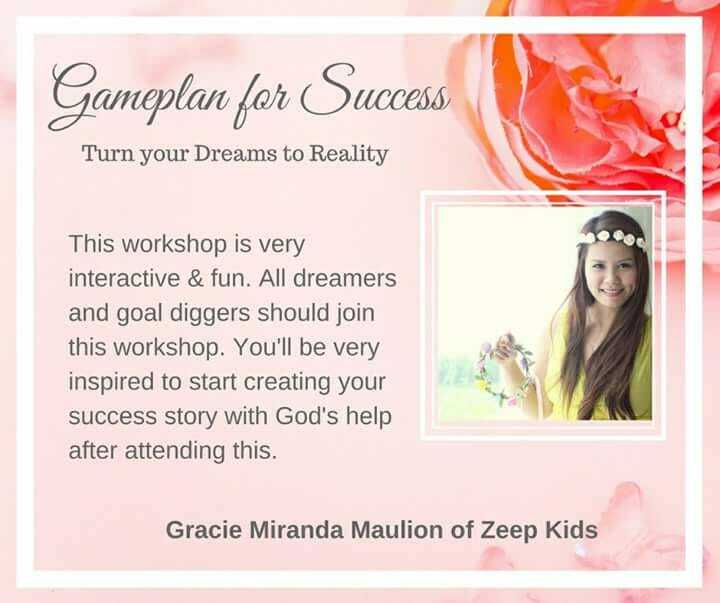 In this second part of the workshop, we will breeze thru the step by step process on how you can successfully launch your business. 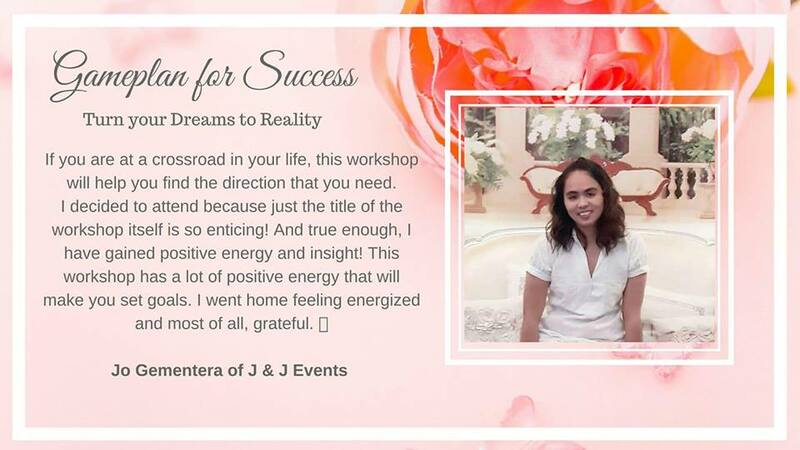 Below are testimonies of some of the women who have been helped and enlightened by this workshop. 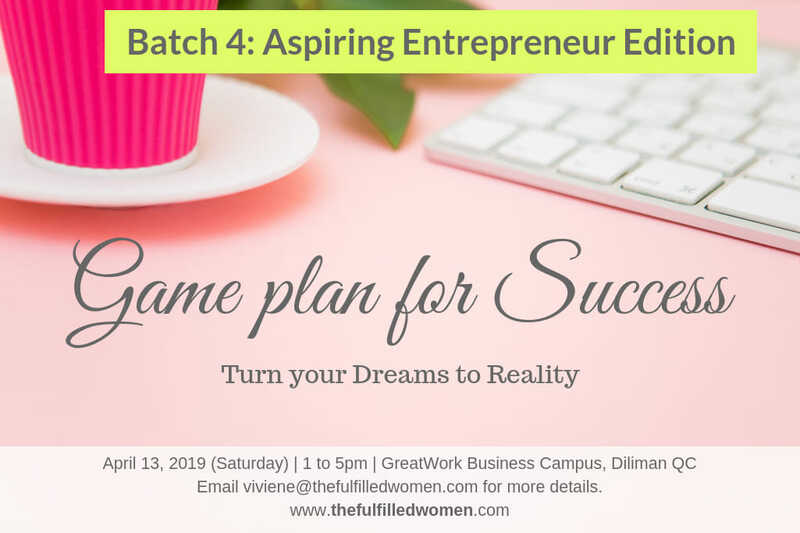 This awesome event will be held on April 13, 2019 from 12:30 noon to 5pm, at the GREATWORK BUSINESS CAMPUS 3rd Floor, Main Building, Ben-Lor IT Center, 1184 Quezon Avenue, Diliman, Quezon City. And because we really want you to be a part of this event, we are giving you a Php 300 discount! Yay! Just click on this link to register https://forms.gle/e7pSd35SwaPBAZvB7 and type blogger_pinionsandplumageoflove in the Remarks section. So, are you ready to crush your goals and turn your dream into reality? Then, see you there! I was pregnant with our daughter when my husband and I were already thinking what kind of education we would like to give our daughter - that was, what school to send her to. You see, as a licensed educator, I used to equate "quality education" with "costly/expensive schools". I believed, at that time, that the kind of school had always something to do with the quality of education a child would get. I would like my child to study in a school where she and her interests matter and she would be trained and prepared to face the world and "live life". Then I heard about homeschool/homeschooling. The first time I heard about it, I was neither skeptical nor a believer. Out of curiosity, I asked this friend who mentioned it to me what homeschooling was. It was a new idea to us. I had never read about it nor heard other Filipino families doing it. But my curiosity got the best of me. I began to research about it. And like one who hasn't been fed for a long time, I devoured every information I got. 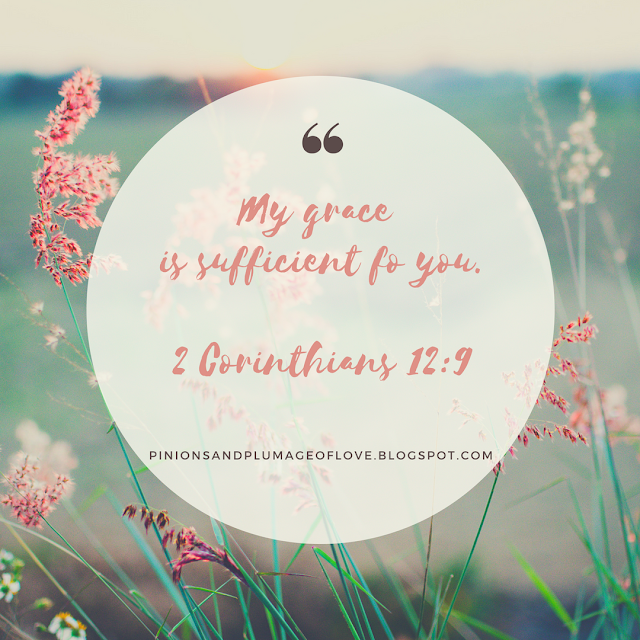 Until one day, my husband and I prayed about it and then decided, that yes, we're going to homeschool our daughter. My idea of homeschooling 6 years ago was a far cry from what it really is. I'm grateful that before we delved into the idea, I was able to do a little research (at that time), and continue to learn more about it these days. I believe that there are a lot of parents out there who are still vacillating between homeschooling and putting their kid/s in brick and mortar school. I just thought this post might give you an idea of what homeschooling really is. 1. Homeschooling is not just a trend. The first time I heard about homeschooling, it was not a trend. No one was talking about it, and to think I am an educator. It was not popular. It wasn't as common as send your schooler-kid-to-school-because-that-is-what-you-are-supposed-to-do kind of thing. No, it wasn't like that. Then I realised. Homeschooling is not just a trend that everyone should copy or follow. Homeschooling rather is a tough decision that you and your family make because you know the reason why. It is important that your family's goal and mission are clear to you. Because, to be honest, homeschooling is not easy. Yes, I will say it again. Homeschooling is not easy. But why do we still do it? Because our goal and mission is clear. We know why we are doing what we are doing. 2. Homeschooling is not building a school in your house. If you imagined homeschool to be like "school or classroom inside the house", well, let me assure you, you're not alone! :) That was my idea before! Apparently, homeschooling is so much more than that or should I say totally different from that. You can homeschool without a blackboard and chalk, without a table and chair. Because homeschooling is not a building, rather, homeschooling is the atmosphere of learning that is created in a home and even outside. My daughter and I frequently use our bedroom/bed to do our activities. But learning doesn't stop there. We learn in the kitchen, laundry area, dining table, at the garden, even during our travel time. Homeschooling is not confined within the four corners of a building. 3. 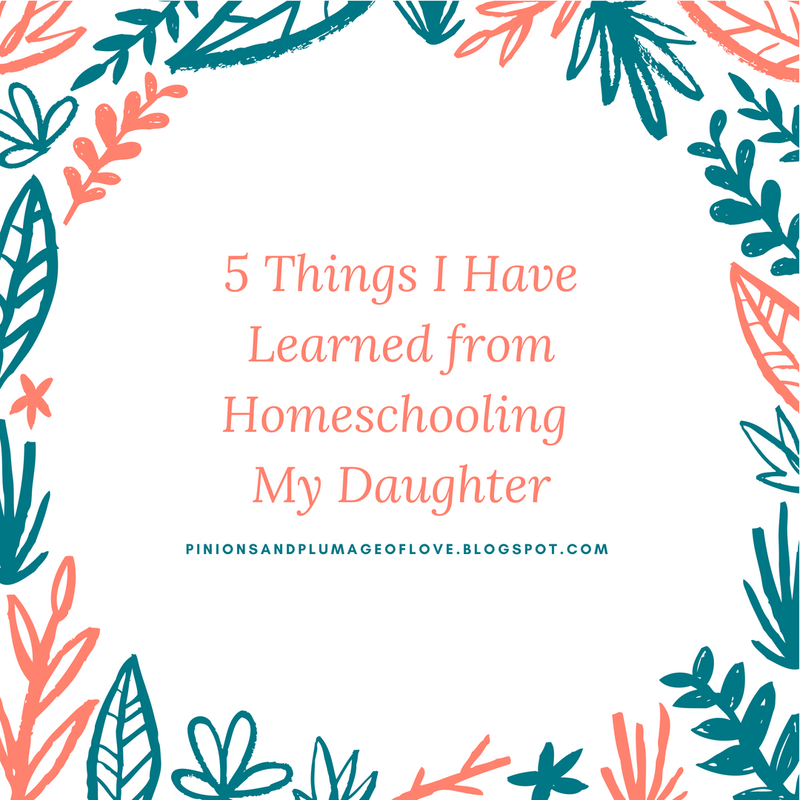 Homeschooling is not just paper and pencil. When my daughter and I were in Australia, my niece (older than my daughter) was in her summer break. She knew I'm homeschooling my daughter. One day, while she was holding her pencil and paper, she asked me, "Mommy Joy, can you please homeschool me too?" Gladly I said, "Sure!" And you know what she did? She sat in front of me with her pencil and paper. Then I told her this, "Kindly pick up the toys which you have played with a while ago. Please pick up the pieces of paper that are scattered on the floor too." Then she looked at me in disbelief and asked, "Mommy Joy, I asked you to homeschool me." So I told her the greatest surprise of her life (at least at that time), "Yes, I know. That is part of homeschooling, teaching you life skills." Homeschooling goes beyond the holding of paper and pencil. Homeschooling teaches a child one of the most important skills in life, that is, life skills! Rather it's showing the real world to the child. I can't think of another effective way of learning about life and the real world than to be exposed to the world. While others think (and often this is the primary concern of most parents) that socialisation is compromised, homeschooling in reality gives a child every opportunity to socialise and interact with people from all walks of life. 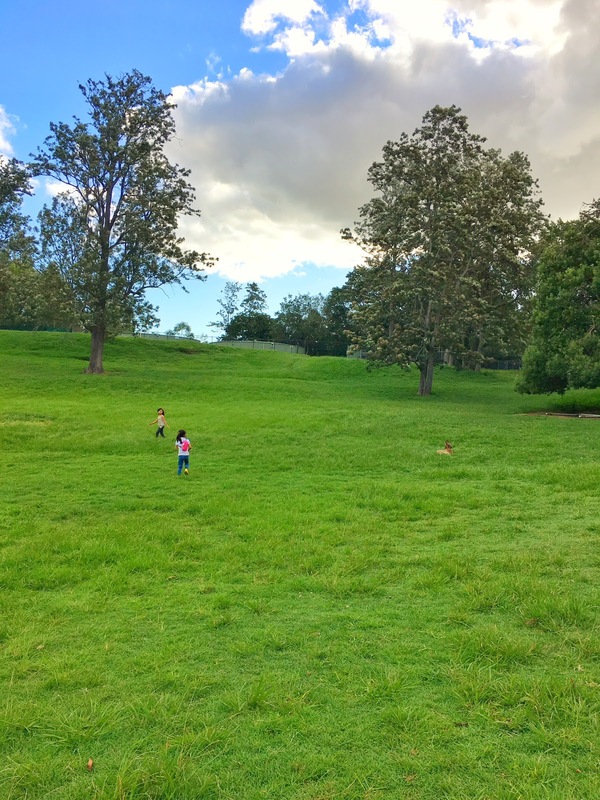 I remember when we were in Australia, while we were in a playground, a mom talked to my daughter and praised her for being a nice older sister because she's taking care of her cousin. My daughter aptly said, "Thank you. But actually, she's not my sister, she's my cousin." When I approached my daughter, the mom happily told me about their conversation. Please know that we don't know this mom. We just met her at the playground. And this is not an isolated occasion. 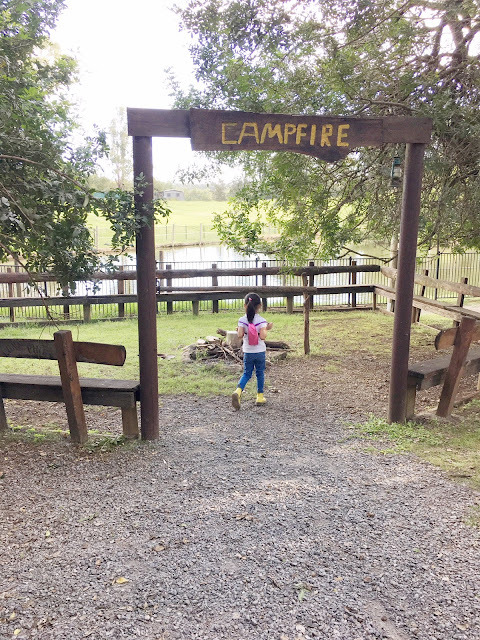 There were many other situations wherein my daughter had "socialised" well - with kids her age, older, younger and even adults. Homeschooling doesn't get socialisation out of your kid's life. On the contrary, it expands your child's world, thereby providing greater and wider opportunity for interaction with society. 5. Homeschooling is not cheap. My daughter was 4 years old when my well-meaning Dad asked me in what school I would like to send my daughter to. My family saw a potential in my daughter, and they're all saying she's smart and should be sent to school (By the way, we've been homeschooling her since she's a year old). When I told him and the rest of the family that my husband and I decided to homeschool her, they were all in shock! I'm not kidding! The reason: because they had not heard about homeschooling (so they thought I was radical, haha). My very supportive older sister even asked me that if money were not an issue, where would we send her niece to school. There were also those who thought that maybe because we're saving money or we couldn't afford to send her to a reputable school, we opted to homeschool. You know what though, homeschooling is not cheap! There may be free online resources, or free printable, but it doesn't mean that homeschooling is a giveaway. Looking for curriculum that best suits your family's values and lifestyle costs an enormous amount of time and effort. And don't get me started talking about preparing the lessons and activities. How about the materials needed to conduct some experiments, the books that need to be read? Or travelling to some places to create an experience? Folks, these are not cheap! :) Homeschooling may be perceived as "bargain" by many. Reality speaks though, it is not. 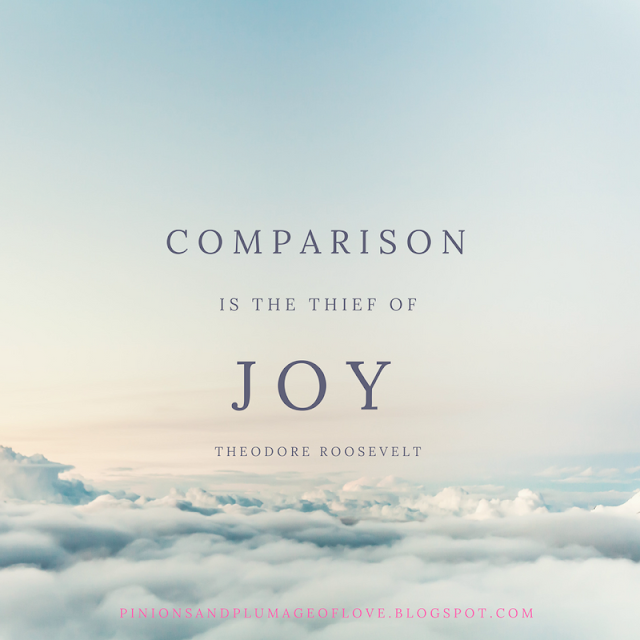 Nevertheless, it is worth every ounce of sweat and every single penny you spend! Homeschooling may not be popular now. But my family and I chose this path. We believe this is where we should be. This is where God wants us to be. How about you? Do you also homeschool? What other thoughts you may want to add? Or maybe you're someone who wishes to homeschool your kid/s but doesn't know how and where to start? I would like to hear from you.